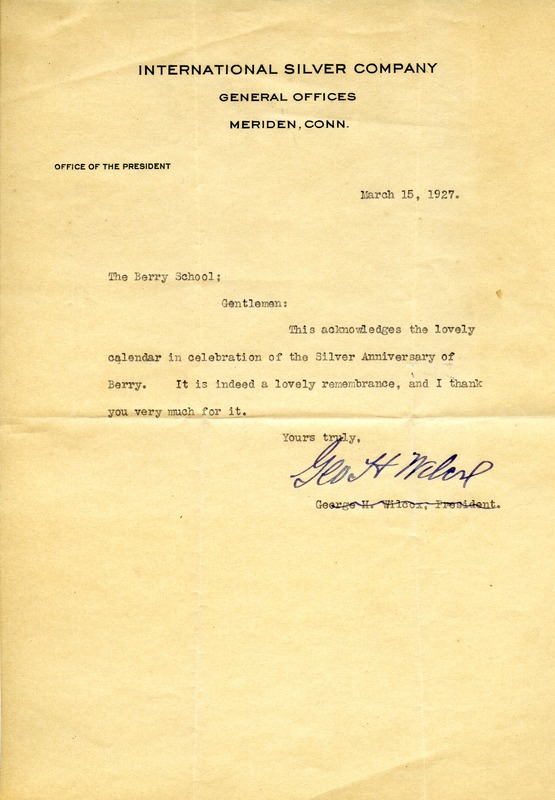 Letter to The Berry Schools from George H. Wilcox, President of International Silver Company, thanking the schools for sending the calendar commemorating the Silver Anniversary of the schools. George H. Wilcox, “Letter to The Berry Schools from George H. Wilcox.” Martha Berry Digital Archive. Eds. Schlitz, Stephanie A., Haley Fortune , et al. Mount Berry: Berry College, 2012. accessed April 26, 2019, https://mbda.berry.edu/items/show/6119.